The staircase at the lobby ... natural materials used extensively. The newest Westin in the region, which opened recently in Dubai, UAE, has been carefully designed to offer an energising yet soothing experience within its nature-inspired ambiance at its highly prestigious locale – Al Habtoor City. The Westin Dubai opened on August 31 and joins two other hotels at the development: the St Regis Dubai, which opened last November, and the recently opened W Dubai – Al Habtoor City. Part of Starwood Hotels and Resorts, The Westin Dubai, Al Habtoor City, is the second Westin hotel to open in Dubai. It is also the largest Westin hotel across Europe, Africa and the Middle East. Rising to 41 storeys and located on Sheikh Zayed Road, the hotel features 1,004 tranquil guestrooms – including 142 suites – featuring floor-to-ceiling windows and the six delectable restaurants offering global cuisines that have all been carefully designed to offer a refreshing stay. The views of the soon-to-be-completed Dubai Water Canal, the Heavenly Spa by Westin with 20 treatment rooms and the 24-hour WestinWorkout facility and fitness programmes such as RunWestin and Gear Lending, promise a truly revitalising stay that will leave guests feeling well-rested, well-nourished and well-cared for, according to a spokesperson for the hotel. All rooms and suites feature the world-renowned Westin Heavenly Bed and dedicated Sleep Well Menu, invigorating rainforest shower and a separate Heavenly bathtub, along with Westin’s signature bath amenities. “At this stage, we have five of six restaurants and bars fully operational – Cook Hall, Il Capo, Seasonal Tastes, Blinq and Daily Treats, as well as our meetings and events facilities. The Heavenly Spa and WestinWorkout fitness centre will be launched soon, followed by the pools and Firefly – our outdoor lounge. These first months are crucial to fine-tune service and enhance the overall experience at The Westin Dubai, Al Habtoor City,” he says. Relaxing pastels ... the reception area at the property. 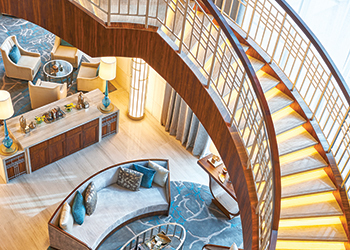 The interior design of The Westin Dubai, Al Habtoor City was led by the Dubai-based WA International Interior, which is renowned for its large portfolio within the hospitality industry. As in every Westin around the world, the interior design is conceptualised and executed to bring nature into the hotel. For The Westin Dubai, Al Habtoor City, the source of inspiration for the lobby and interiors was the region’s Hajar Mountains and the Art Deco movement. “Following the Westin’s brand design approach, our interiors feature a residential aesthetic inspired by nature to make guests feel at home; the natural elements enhance creativity and clarity of thought and the sensory-rich welcome of eco-sensitive natural elements, colours, and textures adorned with stylised Art Deco motifs create a relaxing yet invigorating environment,” the spokesman says. “With Feel Well being one of the six pillars of the Westin brand – which promises guests that after their stay they will leave feeling a better self – the design concept plays a crucial role in setting the scene for this state of mind to be accomplished,” he adds. Across the property, the inclusion of natural materials and elements in their true form, such as wooden benches and art pieces, integrate nature into the space. In addition, the use of materials and patterns that evoke natural imagery and the creation of protected, intimate spaces that offer refuge as well as elevated/expansive vantage points that provide perspective, brings guests a sense of adventure and freedom which is inspired by the Hajar Mountains. The Westin Dubai, Al Habtoor City ... guestrooms have an air of tranquillity. The Al Habtoor City Hotel Collection follows a consistent architectural design. The exceptional concepts were developed by British architects John and Partners, with detailed development by Khatib & Alami, one of the region’s most prominent architectural firms. 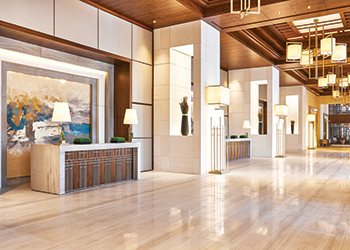 The Westin Dubai, Al Habtoor City has the same colour scheme throughout the entire property, featuring a timeless and classic design with a colour palette where pastel colours set a tranquil and soothing tone, while Art Deco-inspired detailing is accented with embossed leathers and metallic nickel and mauve hues. The colour scheme is again inspired by the Hajar Mountains with a lot of browns and greens.